I was introduced to Kirsty Eagar’s beautiful writing through Raw Blue, which I read and loved way back in 2011. Wowza, I didn’t know it’s been that long! I was pretty excited when I found out that she has a new book this year and with such a bright and fun cover too. I saw Aussie bloggers raving about Summer Skin, and I knew that I needed to have my own copy sooner rather than later. 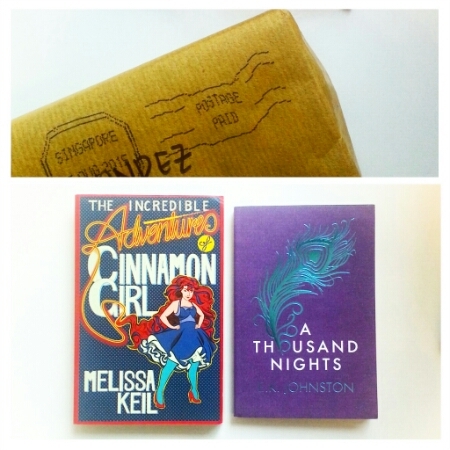 Thankfully, Book Depository now has stocks of some Aussie titles and I was able to order Summer Skin from their store. I couldn’t resist reading it as soon as my copy arrived. I was reminded of how good Aussie fiction is, and now I want to read ALL THE BOOKS. The lesson: don’t mess with Unity girls. The target: Blondie, a typical Knights stud, arrogant, cold… and smart enough to keep up with Jess. A neo-riot grrl with a penchant for fanning the flames meets a rugby-playing sexist pig – sworn enemies or two people who happen to find each other when they’re at their most vulnerable? It’s all Girl meets Boy, Girl steals from Boy, seduces Boy, ties Boy to a chair and burns Boy’s stuff. Just your typical love story. It was a good thing I started reading Summer Skin just as the weekend started because I was engrossed from start to finish. I stayed up way too late (or too early depending on your definition) on a Friday night to read it. I would have gobbled it up in one go if I didn’t have plans to go out with a friend. As it is, I devoured it as fast as I can. I’m going to try and be coherent in this review, but I basically just want to say, GO FORTH AND READ THIS BOOK. Summer Skin is the kind of book that makes me want to go back in time so I can give it to my teenage self. I think it would have changed my life back then. The Aussie college experience described in this is different from my own experience in the Philippines in a lot of ways, but strangely similar in certain aspects, especially in the emotions involved. Like the feeling of having more independence than you had in high school, without the responsibility that comes with being an adult in the workforce. And also trying to make sense of things but feeling clueless. I felt that Kirsty Eagar did an amazing job of describing the crazy roller coaster ride of college days, when the highs were so high and the lows were so low. Jess intrigued me from the first scene. I thought she and her girlfriends were all awesome. I kept wanting to cheer them on, YOU GO GIRLS. The four of them have such distinct and varied personalities, and it was fun to see how they balanced each other out. I felt that they have just the right mix of flaws and strengths for teenage girls. They were far from perfect and they made mistakes, but they also tried to learn as much as they can from those mistakes. And they showed their strengths in ways that suited their personalities. They’re in that stage of their lives where they’re still trying to figure things out, and they’re starting to gain more awareness about themselves. It was helpful that all throughout that process, they have each others’ backs. It’s always a pleasure to read about strong female friendships because that’s always something that I would be able to relate to. I met some of the best friends that I have during college, and I can’t imagine life without them. It’s obvious from the book’s summary that Summer Skin has romance in it, and I thought it was very well-written. I seriously could not get enough of Jess and Mitch! I loved all of their interactions, and I kept waiting for scenes that had the two of them together. I’m normally not a fan of drama in a romance but everything that Jess and Mitch went through felt necessary. They needed to experience all of it to grow and develop both individually and as a couple. I wouldn’t call their romance slow burn because sparks fly the moment they meet and they do act on it, but the depth in their relationship is earned the hard way. Also, I thought it was really cute that their family and friends were invested in their relationship. One of my favorite scenes was Jess and Mitch’s brother trying to get to know each other better. The adults in this novel were pretty great, they treated the younger characters with respect – giving advice whenever necessary but ultimately letting Jess and Mitch make their own choices. As an aside, there’s a lot of music mentioned in the novel and while there isn’t a playlist found at the end, it can be found here. Summer Skin is the kind of book that you would hug to yourself after you turn the last page. I have a feeling I’d be sorely tempted to reread this sooner rather that later. Definitely one of my best reads in 2016, I’ve already started book pushing this to all my reader friends. Immensely readable, Summer Skin deserves to be read by anyone interested in realistic fiction about college experiences. I will be anxiously waiting for Kirsty Eagar’s next novel. I know I just did a cover reveal post yesterday and here I am, doing another cover-related post. But I just wanted to share the news about two Aussie YA novels that I’ve been looking forward to reading: Cloudwish by Fiona Wood and In-between Days by Vikki Wakefield. I found out yesterday that both of them will be published in the US (and will therefore be readily available internationally)! This is exciting news because I’ve previously enjoyed reading books from these two authors (my reviews of Six Impossible Things, Wildlife and All I Ever Wanted). I also think both covers look pretty, the type of covers that would encourage me to pick up the book even if I don’t know anything about the contents. I found out about Cloudwish’s cover reveal in this announcement. To be released October 18, 2016. I found out about In-between Days from a tweet from the author. To be released August 30, 2016. Sixteen-year-old Jacklin Bates (aka “Jack”) believes the only way to soar beyond her life is to drop out of school and move in with her free-spirited sister, Trudy. But Jack quickly discovers her sister isn’t the same person she used to be. And when Jack loses her job and the boy she loves breaks her heart, she becomes desperate for distractions. She strikes up an unlikely friendship with Pope, a lost soul camping in the forest behind her house. And then there’s Jeremiah, the boy next door with a kind, listening ear and plenty of troubles of his own. Together, over an endless summer, Jack and Jeremiah fix up the abandoned drive-in theater at the edge of town. But even as a fragile romance builds between them, Jack knows deep down that she can’t stay in limbo forever. When Jack faces losing Jeremiah, she searches for a way to repair their relationship — beginning with the other broken pieces in her life. Only, sometimes the hardest part of starting over isn’t choosing a path… it’s figuring out how to take that first step forward. Now I just need Summer Skin by Kirsty Eagar to be published in the US and I’ll be all set! But I heard it’s available from the Book Depository so maybe I should try ordering it from there. Aussie readers are so lucky that these books are readily available to them. What do you guys think of these covers and book summaries? Do they make you curious about the books? Also just wondering in general, are you familiar with Aussie YA? Just a quick book haul post at the start of this long weekend. We’re having a four-day weekend to celebrate Singapore’s 50th year of independence. Happy Birthday, Singapore! 🙂 I would have loved to take advantage of this long weekend by traveling but flights are so expensive because I wasn’t able to book anything months in advance. So I’m looking forward to a weekend of just relaxing and reading books. Earlier this week, the latest installment in my favorite urban fantasy series was released: Magic Shifts by Ilona Andrews! I had to take a pic of this book with my blog header because the Kate Daniels series was one of the inspirations for my current header’s design. 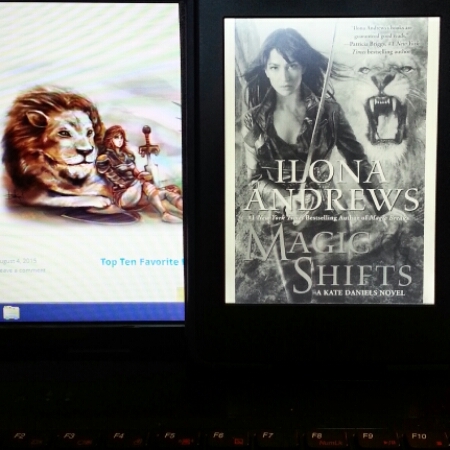 I’ve been really good about waiting to read Magic Shifts because I knew that once I start, I wouldn’t be able to stop. I’m going to devour it this weekend! An Aussie YA novel and an ARC of a retelling of Arabian Nights! I haven’t tried both of these authors and I’m looking forward to doing so. I also have Melissa Keil’s other novel, Life in Outer Space, which I grabbed from the SG Book Deals warehouse sale. I really think it’s pretty cool that some Aussie titles pop up in SG. As I mentioned in a recent TTT post, I love reading retellings so it would be interesting to see what A Thousand Nights will be like. What about the rest of you, have you acquired any new books lately? What are you planning to read this coming weekend? Andrea K. Höst has generously lowered the prices for individual copies of her books for US$0.99 each until the end of the year. Links to Amazon and Smashwords. I LOVED both the Touchstone trilogy and Medair duology, which I read earlier this year. 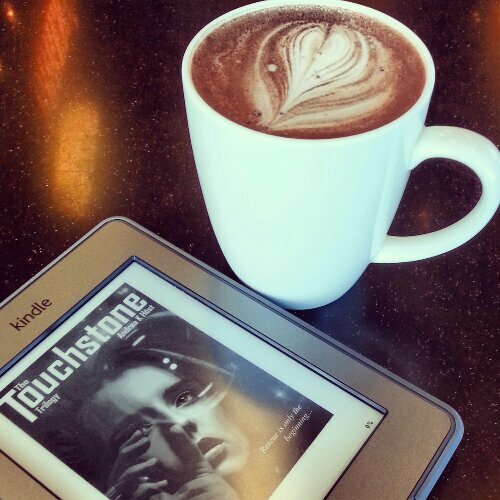 Since then, I’ve reread most of the Touchstone books just because I’ve been itching to do so. I’ve also reviewed And All the Stars here. 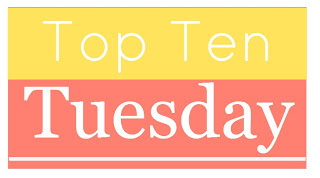 I also wrote a guest post for Andrea K. Höst week back when Rachel Neumeier organized it. I hope all of that is enough to convince you to give her books a try, especially while they’re currently on sale! I read Six Impossible Things years ago and I remember enjoying it but unfortunately, I couldn’t remember details of the story now. I would have loved to reread it prior to reading Wildlife but my copy is in Manila, I’m not even sure which friend has it at the moment. 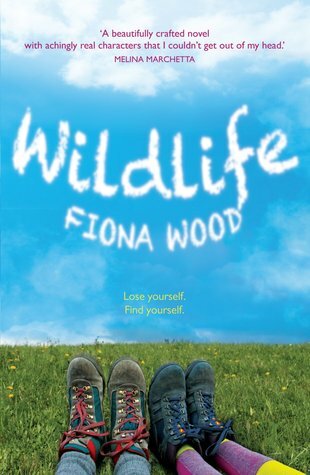 I have been looking forward to Wildlife ever since it first came out and I saw Aussie bloggers raving about it. I was able to get a copy last year when a friend from Australia passed by Singapore on his way to Manila. I can’t believe it’s taken me this long to read it! Life? It’s simple: be true to yourself. In the holidays before the dreaded term at Crowthorne Grammar’s outdoor education camp two things out of the ordinary happened. And I kissed Ben Capaldi. Note to self: do not start reading books late at night if you have a feeling they’re going to be good. I spent a good chunk of one weeknight reading Wildlife and stayed up until 2:30am to finish it. Yes, I needed coffee to survive work the next day. Narrated from the points of view of two characters, Lou and Sibylla, this Aussie YA novel is an engaging read. My heart went out to Lou because of her loss and the grief that she’s still coming to terms with. It’s understandable how closed off she is at the start of the novel. Sibylla is a likeable character, very low-key and cares deeply for her friends. We didn’t get to see his POV but another character I really liked was genius and quirky Michael, who is also very loyal to his friends. I also found the setting refreshingly different, high school students spending a term out in the bush. It’s like a combination of boarding school and camp, away from the city and family homes. I can imagine how difficult it would be for a teenager to adjust to that kind of set-up. Constantly surrounded by others and absolutely no privacy. I find that living on such close quarters like that can either strengthen or destroy relationships. People can either become very comfortable or very annoyed with each other’s quirks. It was interesting to see how the dynamics between the characters changed as the book progressed. I have to be honest, there was a point in the book when I got frustrated with Sibylla and how passive she is with her relationship and friendship. I was all, “C’mon girl, learn to push back a little.” But it’s not like she’s not aware of the situation she finds herself in because she definitely is. She knows that the balance is tilted in Holly’s favor when it comes to their friendship and she’s also aware of the nuances of dating a popular guy like Ben. It then occurred to me that Sibylla is still in the process of getting to know herself, she hasn’t fully settled into her own skin and as a result, she’s also not sure of how to react to and interact with those around her. It’s a very truthful and realistic portrayal of teenage life. Looking back on my own experiences, I have to admit that not all of the relationships and friendships that I’ve had were healthy or good for me but that’s just how life is. We all make mistakes and that’s how we learn and become better people. So even though I was initially annoyed by some situations, in hindsight, I loved the accurate descriptions of relationships (both romantic and platonic) in Wildlife. It’s all messy and complicated and confusing and feels very real. This is one of those books that I would gladly give to my teenage self because I know I will be able to relate to it. 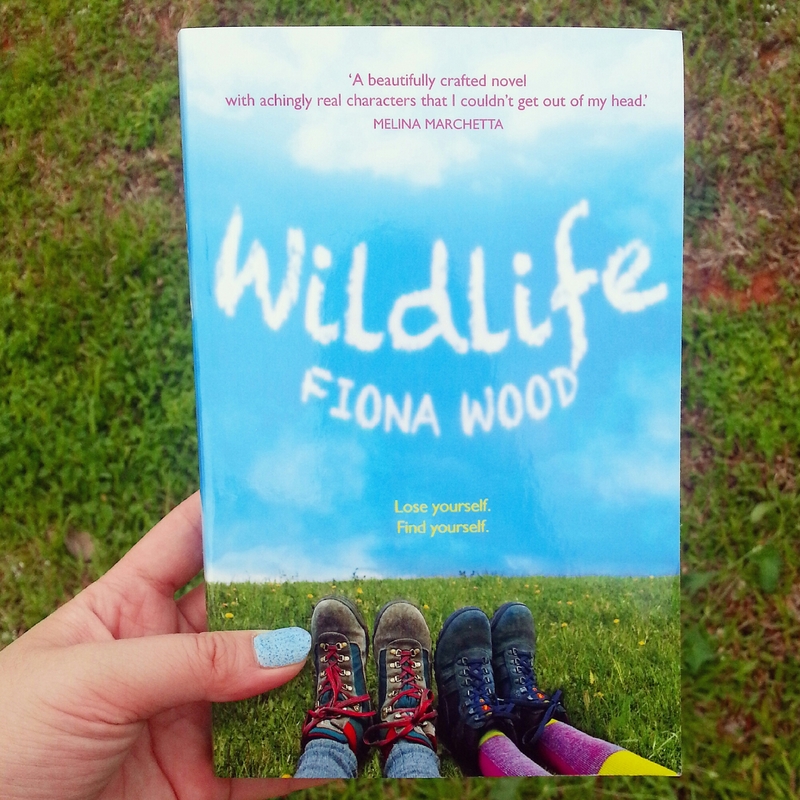 Wildlife reminded me of how brilliant Aussie YA is and I’m so glad I still have a couple of Aussie YA titles in my TBR pile. One of my favorite reads for this year, I recommend Wildlife to fans of realistic young adult fiction. I really liked Andrea K. Host’s And All the Stars last year and even included it in my best of 2013 list. I have been meaning to read the rest of her books since then. 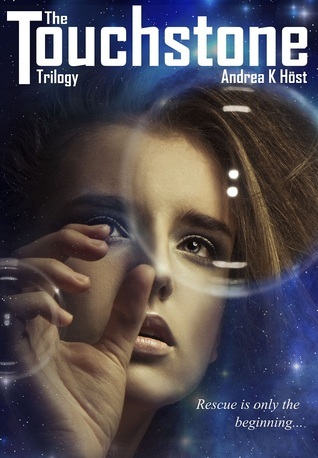 I know that several friends (namely Rachel, Estara and Li) have loved the Touchstone trilogy so I requested a review copy from the author and started reading it as soon as I was in the mood for sci-fi. I used to say that I’m not much of a sci-fi reader but given how much I enjoy reading Andrea K. Höst’s novels, it seems like I should read more from that genre. I read the omnibus version of the trilogy so this is a review for all three books – Stray, Lab Rat One and Caszandra – although I wouldn’t be mentioning any spoilers. How can I not like someone who says things like that? I was also fascinated with the technologically advanced world that Andrea K. Höst created – with nanotechnology and tiny computer interface that can be injected in human brains. You can do all sorts of amazing things with the interface like record what you’re seeing, watch movies, read books and play interactive games. In this world, there are also psychic space ninjas called Setari who are specially trained military personnel tasked with keeping the known planets and the space around them safe. Setari have special talents like telekinesis and enhanced sight/senses. Due to certain developments, Cass spends most of her time with the Setari and even befriends some of them. To be honest, I was a little confused with the number of Setari and their talents but I didn’t let that bother me and just kept reading. One of the aspects of the story that I truly loved was the romance. I kept reading because I wanted to find out what will happen with Cass having such a big crush on someone. I thought she was destined to have “On My Own” as her theme song but fortunately, that wasn’t the case. Slowest burn romance that I’ve read in a while! It reminded me a little of the romance in Crown Duel, with a male character who’s all stoic and unreadable, skilled in combat and also a great leader. I was so absorbed by this series that I kept squeezing in time to read it even though I was supposed to do other things – like pack for a trip home or get some sleep. I even read bits and pieces of this in the car, which I don’t normally do because it makes me dizzy. I hope that gives the rest of you an idea of how engrossed I was. The story lingered in my mind days after I finished reading it, giving me one heck of a book hangover. I devoured the Gratuitous Epilogue, which features the events after the trilogy, right after I finished the three books. What’s interesting is that I think Touchstone will even be better as a reread because I wouldn’t be confused by some of the things that initially bugged me and can pay attention to other details instead. I can now safely say that I’ve become an Andrea K. Höst fangirl. Seriously, more of my reader friends should be introduced to her work. If you haven’t read any of her books, consider this a push in the right direction. I already have Medair in my Kindle and I’m looking forward to reading it. Want Books? is a weekly meme hosted here at Chachic’s Book Nook and features released books that you want but you can’t have for some reason. It can be because it’s not available in your country, in your library or you don’t have the money for it right now. Everyone is free to join, just grab the image above. Leave a comment with a link to your post so I can do a roundup with each post. I really enjoyed reading Fiona Wood’s debut novel Six Impossible Things back in 2011. Her second book Wildlife has been released recently and I’m really curious about it. It has a blurb from one of my favorite authors, Melina Marchetta: “A beautifully crafted novel with achingly real characters that I couldn’t get out of my head.” I’ve also seen reviews from Aussie book bloggers – Nomes, Mandee and Reynje – and they all made me want to read the book more. There are times when Aussie books pop up in bookstores here in Singapore so I asked around for Wildlife when I dropped by two bookstores yesterday but unfortunately, it’s not available over here. I was thinking of giving in and trying Fishpond for the first time. I wanted to get Wildlife and Girl Defective by Simmone Howell but the latter is out of stock. I’ll probably wait for that to become available before ordering. How about you, what book is at the tip of your wishlist? Hope you’re all having a good weekend so far.